Students of JJC may be forced into a tough situation before they even know it. Students eligible for the Illinois Monetary Award Program (MAP) grant may be obliviously walking the campus halls, not knowing that their Financial Aid funding may be frozen, or worse, seized. On Thursday, Sep. 24, 2015, JJC held the first of four conference hearings for the Senate of Higher Education to discuss the impact the current Illinois budget impasse is having on higher education in Illinois, specifically pertaining to MAP grants. As of September, Illinois entered its fourth month of not having a budget plan in place. This is a significant issue because the budget plan was due to go into full effect on July 1, 2015. Due to constant lobbying in Springfield, the Illinois budget is only 90 percent accounted for, and Republicans and Democrats are having a difficult time figuring out an appropriate way to spend the remaining 10 percent. Now, this is where the real issue comes to the surface. A lot of government funded programs around Illinois cannot all be accounted for with the remaining 10 percent of the state budget and social services like MAP grant funding could be taken out of the budget because of it. That would require the House of Representatives and the Senate to find common ground on which government programs should continue to be funded and which ones should be subsidized. The purpose of MAP grants are to provide students with financial aid that does not have to be repaid. It is used by Illinois residents who attend approved Illinois colleges and demonstrate financial need. The MAP grants are the only funding that some students have, and losing that could be detrimental to their lives. To be considered eligible to receive a grant, there are several requirements students must meet. They must be an Illinois resident; they must be enrolled into a minimum of three credit hours per term; they must maintain good academic progress; they cannot be in debt with student loans; and they must have completed a Free Application for Free Student Aid (FAFSA). 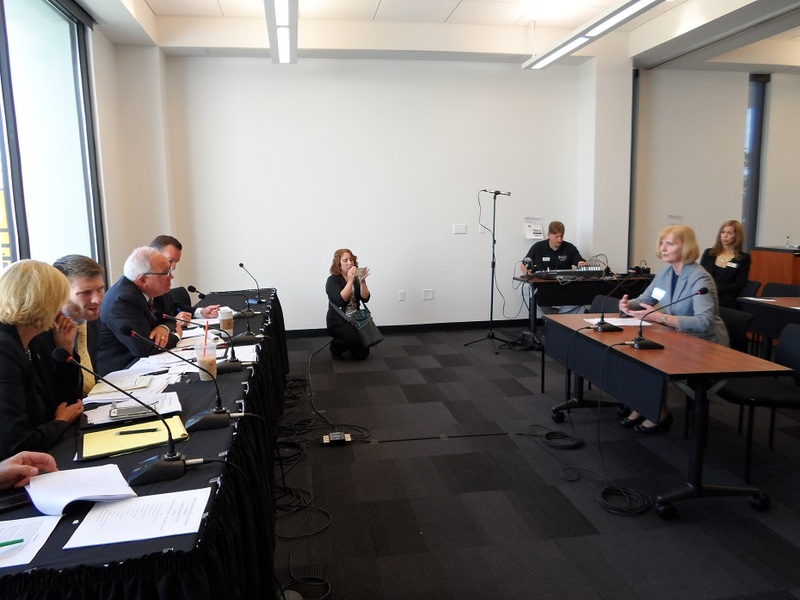 The Sept. 24 panel was chaired by different Senators from around the state, with representation from local colleges and universities around Illinois, as well as the Illinois Committee College Board and the Illinois Student Assistance Committee. Leading the discussion was Sen. Pat McGuire (D-Crest Hill). By his side were colleagues Sen. Andy Manar (D-Bunker Hill), Sen. Jennifer Bertino-Tarrant (D-Shorewood), and Sen. Sue Rezin (R-Peru). Some programs up for debate besides the MAP grants were The Grow Your Own Teacher Program and programs that help single parents with children that need care. Colleges and universities around the state traditionally receive $2 billion from the state budget, but as of now a good portion of that state funding for the financial programs has to be subsidized by the state. As the conference went on into the hour, each representative walked to the podium to state their school’s case for what would occur if they lost their state funding, and how dramatic the consequences would be for their students and the faculty that work there. Another issue the representatives brought to the board’s attention was that the colleges do not know what to tell their students when regarding the application process of obtaining a MAP grant. This is leaving students in a complete stump, because not knowing the deadline, or just being told a fixed deadline, does not give the average student much time to fill out one of these applications. The most intriguing part of the whole conference was that students of each represented school had a chance to speak at the podium and give a brief story on how they were eligible for their MAP Grant and how losing funding would impact everything in their lives. JJC student Andrea Louthian gave an outstanding speech that really touched everyone in the room that morning. Louthian was an elementary education major at JJC, and confidently walked to the podium to share glimpses of her personal life. Emotional while she was speaking, Louthian discussed how she was about to enter her last semester before she graduated, and by losing her funding she could not afford to finish out the year. Louthian said that she works when she is not at school while also putting her two children through school. The magnitude of the situation went beyond her words. Other students negatively affected by the budget impasse put in their input on the mess in Springfield. Another student from JJC, Jewels Gomez, also gave a few words on her own struggle with the MAP grant circumstances. Gomez explained how she would be wrecked by the MAP grants disappearance and how her part time job could not cover her tuition. MAP grant enrollment imbalance was not lost on the representatives at JJC. “This year there are more who qualify for MAP grants and didn’t receive it then students who were equally qualified and did receive it,” said McGuire. Could the MAP grants be the only grant to go? Only time will tell. JJC students who receive financial aid are encouraged to be aware and stay alert for any updates.